The great Spanish painter Francisco Goya (1746-1828) is one of those artists whose work doesn’t always move me, especially that work that came before he was fifty year old and was serving as a Court Painter to the Spanish Crown. That work is fine but remains, for me, unremarkable. It feels academic and restrained and not unlike the work of any number of other Master painters. It adhered to all the rules. 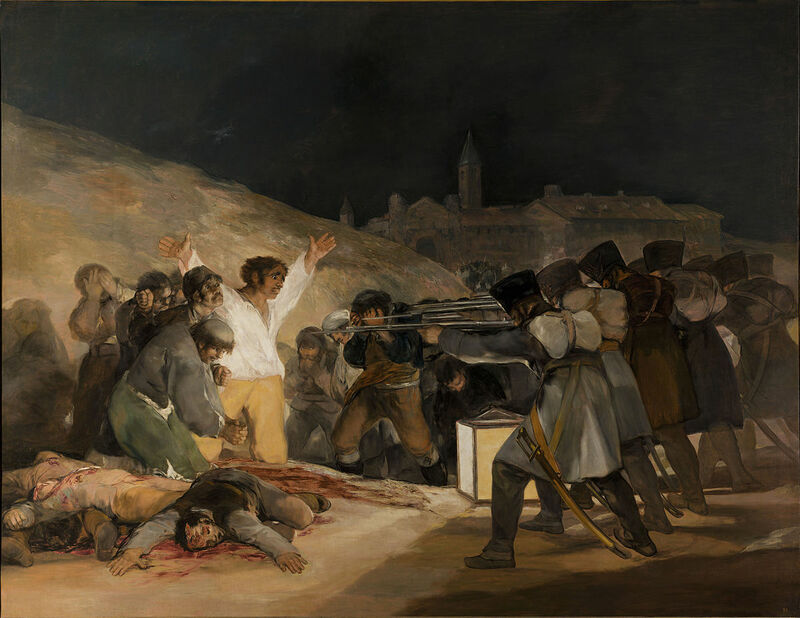 But with an illness in 1793 that left Goya with the deafness that profoundly affected him, his work began to move in an altogether different direction, one that would mark him as one of the great transitional artists in the move from the Old Masters to the modern era. The work began to grow darker and was not centered around portraiture and genre paintings that would please the upper classes. The work from this time dealt with themes based on mythology, superstition and witchcraft, and the wars and political upheaval in the Europe of that era. It is often disturbing work that often eschewed the traditional rules of painting and created a new art form would come to define his name. One of his most well known paintings, The Third of May 1808, shown at the top, is considered a groundbreaking work in that it left behind many of the ideas that had ruled painting before it. No Rules is an idea I have tried to embrace throughout my career. It’s nice to know that someone like Goya was one of the first painters to embrace it. Reason in painting is a quality that is not often discussed. But I believe that there has to be a sense of orderliness– reason— in painting that allows the viewer to connect with it, even if they don’t always fully understand why. Even the seemingly most chaotic abstractions usually possess a rhythm and sense of reason that allows an interaction. I have really come to admire Goya’s work more and more over the years. The more I look the more I like. His work has directly– my Outlaws series came about as a result of seeing a group of his miniatures– and indirectly, with his words and thoughts, influenced my own work. Here are a few of my favorites. I encourage you to look on your own. Here is a link to a site with 700 images of his works.